I know that we’re coming into Spring soon (finally!) and I should be posting Springy things like lettuce wraps and lemon curd, but I thought I’d take advantage of these last few weeks left in winter to get in all the hearty comfort food I can until the fall. At any rate, we haven’t seen the last of this winter’s snow yet so I’m still in need of piping hot bowls and mugs to warm my cool hands. Considering how many soups and stews that I eat it’s amazing I don’t have more chili like recipes on my blog. I think that mostly comes from that fact that I usually end up dumping whatever left over bits and pieces I find in the fridge to make said soups and call it a day. 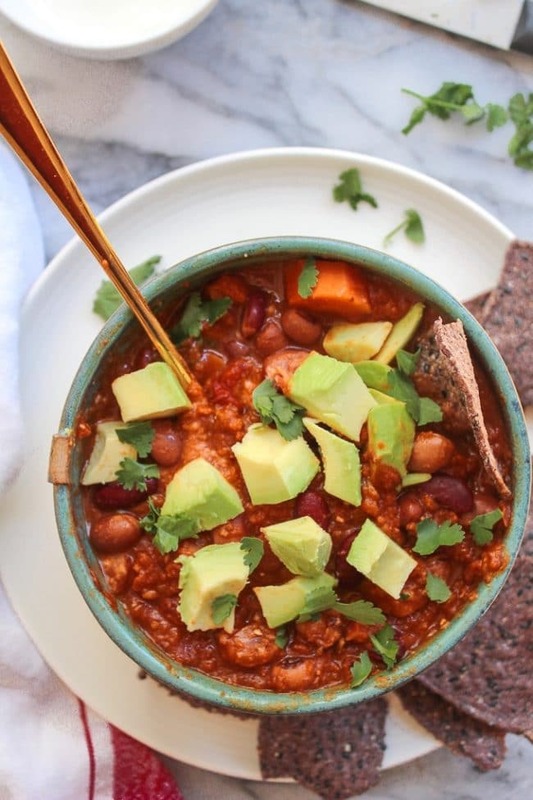 This vegetarian chili was so goo the first time though that I had to keep making it until I nailed down the measurements so that I could share it here with you guys. Bonus: this is a 100% meat free chili. I’ve been making more vegetarian dishes at home lately and it’s amazing how much money we save by eating less meat. I personally eat very little meat – maybe twice a week I’ll have bacon or something like that. Mike on the other hand is a proud carnivore who claims he just doesn’t get full on non meat meals. *eye roll* Since we don’t eat much in the way of grains/pastas/dairy he wasn’t left with much other than meat and veg. Now that he’s introduced beans back into his diet however, I’ve been able to fill him up on meatless mains like like vegetarian chili or chickpea curry’s. No joke, I feel like that is a huge accomplishment. 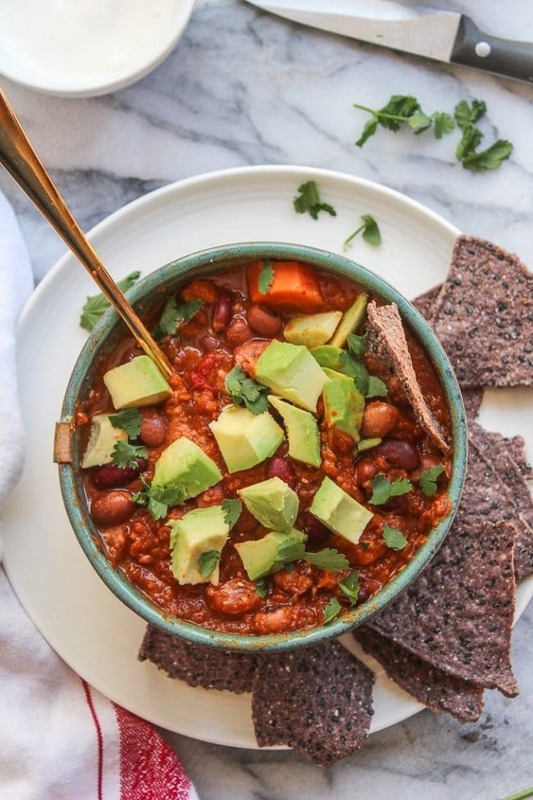 Top with some guacamole, avocado, cilantro leaves and don’t even think about skimping on the tortilla chips and enjoy this chunky, savoury, hearty vegetarian chilli from my kitchen to yours! In a large heavy-bottomed pot over medium heat, warm the olive oil until shimmering. Add the chopped onion, carrot, celery and salt. Stir to combine and then cook until the vegetables are tender and the onion is translucent, about 7 to 10 minutes. Stir occasionally to keep the veggies from burning to the bottom of the pot. Add the crushed garlic, chili powder, cumin, oregano and smoked paprika. Cook for another minute stirring constantly to combine. Add the diced tomatoes and their juices, the drained beans, vegetable broth (or water), liquid smoke (if you are using it) and one bay leaf. Stir to combine. Bring the mixture to a simmer and continue cooking, stirring occasionally and reducing heat as necessary to maintain a gentle simmer, for at least 30 minutes. Remove the chili from heat. Next you're going to mash or blend the chili to get the best texture. You can do this a few different ways: You can use an immersion blender to briefly blend the chili right in the pot or you can transfer 1-2 cups of the chili to a blender and blend until smooth. Alternatively you can also use a potato masher to break up some of the larger chunks. Add the chopped cilantro and lime juice to taste. Season with additional salt and serve. 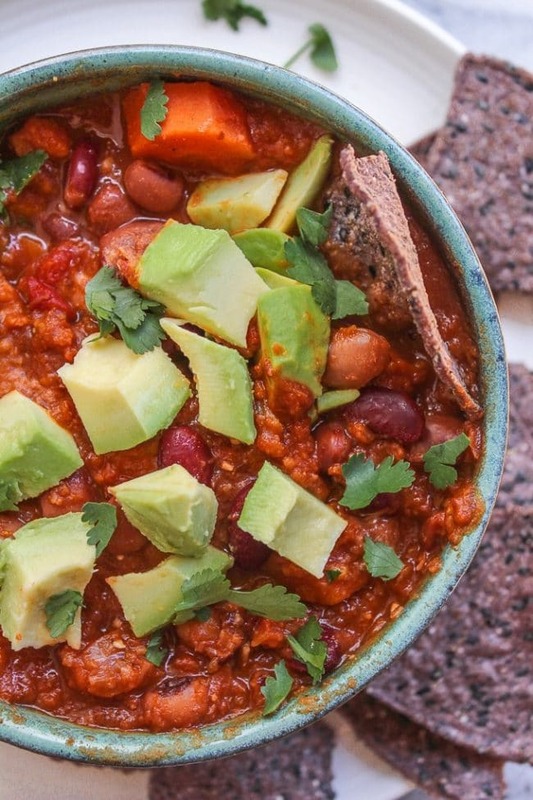 Yumm, I love a good vegetarian protein packed chili recipe. Thanks!